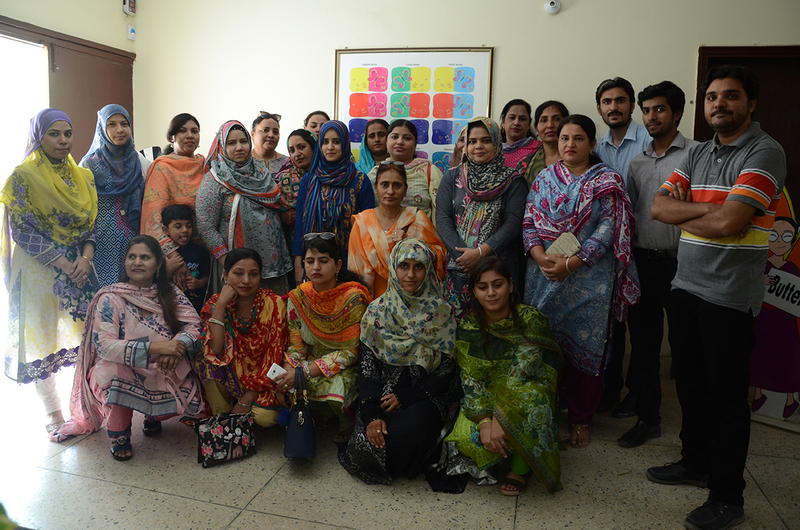 Fifteen teachers from Thatta visit East Education Publishers and Literate Pakistan Foundation last week. Various course books developed and published in East Education Publishers and Literate Pakistan Foundation were displayed to the teachers. We often avoid paying much attention to the weaker children in the class and overlook their hidden capacities. The Jugnu course books provided by EAST are especially designed to upgrade the knowledge and confidence of academically weak children. These books have made learning interesting through story-telling and pictorials. I will request the principal to include these books in our school’s curriculum. 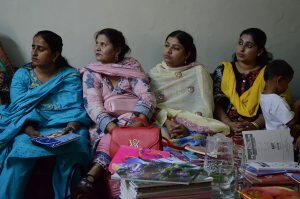 Primary School teacher, Fiza Solangi, from Makli Sindh, along with seventeen other teachers, visited the EAST Education Publishers and Literate Pakistan Foundation as part of an exposure opportunity under the Community World Service Asia and Act for Peace supported Girls Education Project in Pakistan. All eighteen of these teachers, representing different government primary schools in Thatta, have been previously trained on various pedagogical and advanced teaching skills under the same project. The teachers from Sindh were introduced to the various new curriculum approaches that are available and are applied in urban educational systems at EAST. 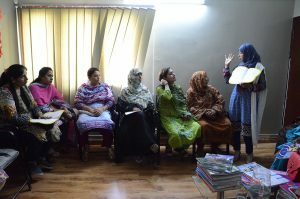 The were also briefed about how some “undereducated” parents of their students can be taught the basics of literacy through different models developed by various organizations. The staff at EAST shared how teachers can apply various techniques of supporting and motivating academically weaker children through a teaching module developed by the organization. 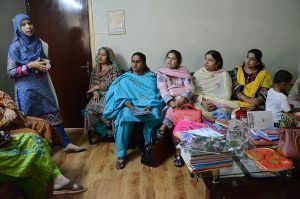 Humaira Farhan, Marketing Manager at EAST, shared their experience of providing tailor made courses for parents who have little or no education background, laborers and underprivileged community members across Pakistan. Komal Sunair, Marketing Manager at E Learn and Earn – ELE, a partnering organization of EAST, also offered kindergarten teaching courses to the visiting teachers. We provide teachers’ training and Montessori training courses focused on early childhood and primary education. We are a research and development organization engaged in the development of teaching and learning resources. The visit of the teachers’ from Thatta was very productive. They were more interested in early childhood education and had queries related to that. These teachers have been teaching primary education; hence, early childhood education was new to them. Education does not accept limitations and the teachers are eager to learn new techniques for making their classrooms more intellectual and fun at the same time. The teachers want to learn new ways to build the capacities of their students and involve them in practical exercises. I believe the books we provide will be very beneficial for the students in rural areas as storytelling and interactive activities will make learning fun for the students. EAST Education Publishers shared their Jugnu series of books and explained how these books help students, especially the weak ones, to build their knowledge and confidence. The books are interactive and deliver lessons through storytelling. Moreover, there are online courses for teachers which will help build capacities and introduce new teaching methods to make classrooms more interactive. This online system of making courses and textbooks available is beneficial for us teachers in rural areas as we cannot travel often to cities. The textbooks provided in the government schools are quite different from the ones provided by EAST Education Publishers. We learnt that there are different levels of books for the same standards, focusing on the capacity of different students. The series of books published by EAST was more focused on storytelling method. I was surprised to see that even the science textbook had stories which were delivering the lesson clearly. The English language used in the books is a bit tough for the students in rural areas as their capacity lacks in efficient English. However, I plan to use the idea of storytelling and incorporate it in the subjects I teach in my school. The activities mentioned in these books can be practiced with the students which will be new and interesting for the students and will help them enjoy learning. Teachers in the rural areas do not have a lot of exposure to urban styles of teaching and academic curricula. These visits provide us with new learnings opportunity and a chance to upgrade our skills. Most of our students were previously mostly involved in extensive reading and rote-learning. After the teachers’ training and exposure visits, like this one, the classrooms have become colorful and friendly. The textbooks taught in the government schools have long lessons with questions to be answered in the end of every chapter. The books published in EAST Education Publishers have interactive exercises and storytelling throughout which makes it interesting and fun to learn.